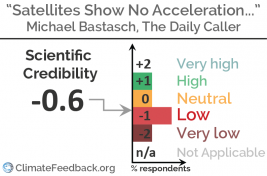 "The content is almost all correct, but the attention-grabbing headline is wrong and isn't supported by the quotes from two scientists or by the rest of the content." 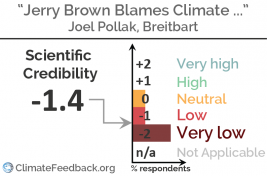 "The Breitbart article provides a poorly reasoned and misleading view of how climate change has contributed to recent fires in California and the rest of the western USA. The most informative part of the article is the link that it provides to a piece by Southern California Public Radio, which, unlike the Breitbart article, provides an informative and unbiased look at factors contributing to these recent fires." "The absence of accelerating warming trends is meant to go against prevailing climate science, but I find that to be a strawman argument. In that sense the article is misleading—however, to its credit, it does report on other published results that contradict this recent study, but it fails to provide further context or to make any effort to compare/reconcile the validity of these different studies." 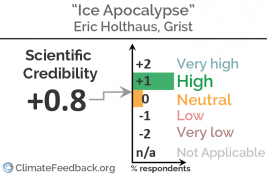 "The article has a bias, emphasizing the high end scenarios of ice sheet behavior, avoiding scrutiny of model assumptions. The concept of marine ice cliff instability and how unusual it is as a mechanism today on the vast coastline of Antarctica or Greenland is ignored." "This article provides an excellent visual of an unfortunately very likely general future for humanity, in which sea level rise slowly inundates many coastal cities ... 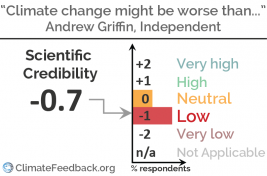 However, one major drawback of this article is that the magnitude and timescale of the sea level rises described in this report are not well explained." "The article reports on a paper which suggests there may be complications with ONE method we use to determine past ocean temperature. 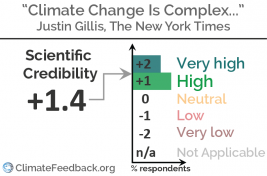 Notwithstanding possible flaws in the methods of the paper, the article ignores significant evidence from other measurements and observations and tells us nothing directly about the severity of future and present climate change." 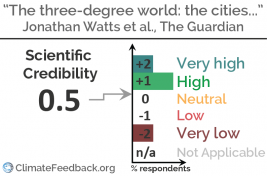 "Yet another in the exhausting heap of opinions choosing not to engage with evidence, while still expecting readers to believe inaccurate and baseless claims. 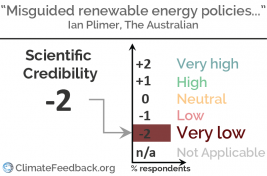 It is baffling why publications such as The Australian wish to promote opinions that are both not well-argued and demonstrably not based on fact." 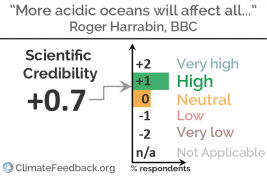 "A good summary of BIOACID's key results. The information provided here is based on peer-reviewed scientific articles... I think these complex (and so far poorly understood) food web interactions deserve attention by both the public and the scientific community." 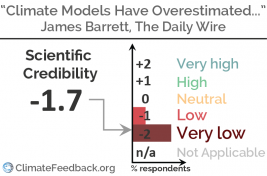 "The article selectively quotes from interviews and scientific papers to create the false perception that climate models significantly overestimate the rate of warming. 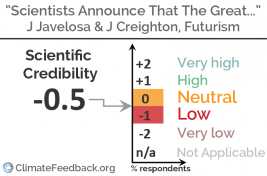 The article also falsely implies that the cited paper is about the so called “hiatus” while the paper is actually about the carbon budget for the 1.5 ºC target."